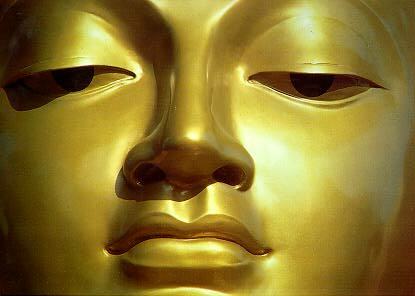 The first step in the practice of looking is to sit in a comfortable position and simply observe with your eyes open. You may assume a lotus position but that is not necessary. The necessary part is to keep your back straight and upright. You may sit in a straight-backed chair if that is more comfortable. When sitting in a chair, however, you must keep feet flat on the floor, and hands in the lap. Make sure you have had enough to eat and rest. You do not want your body to be a distraction. Look at what is plainly visible around you, and also at the thoughts arising in your mind, without associating them with what you see. Once you are comfortable with looking with your eyes open, go ahead and close your eyes. Do not move or do anything. Just be there as an observer. After closing your eyes, simply observe what is there. At first, you may perceive only blackness. But soon you may become aware of light and darkness, various sounds and smells, the temperature in the room, the pull of gravity, the taste in your mouth, and scores of other such perceptions from the body. The mind may present pictures of current or past situations, thoughts, feelings and emotions. It is important to understand who is observing. The body’s eyes are closed so you cannot be the body. You are observing the mind so you cannot be the mind. Who are you then? In the practice of looking you simply are an observer. As you sit with your eyes closed all kind of things will come up, some flattering and some not so flattering. Just look without being judgmental. Do not try to concentrate on any one thing, or try to make the mind blank, as done in meditation. The idea is to look and not suppress anything. It will take time before any activity in the mind settles down. The practice of looking includes experiencing the feelings, emotions, and sensations presented by the mind. The essential part here is not to resist the mental objects that come up. Pictures may come up that remind you of something embarrassing or painful. The normal reaction would be to flinch and look away. But in the practice of looking you must experience whatever comes up, no matter how painful and embarrassing that may appear to be. There is a safety factor built into the mind. That is, the mind would never present something so embarrassing, discomforting, or painful that it is overwhelming. Just be there with whatever comes up. It is important that you let the mind present things to you, and not to present things to the mind. As you persevere without resisting, the painful and embarrassing pictures in the mind will ultimately discharge. There may be a tendency to squirm, twitch, move or change position. This occurs when you encounter something difficult to experience but you are not yet aware of it. Make sure before you start this practice session that you are in a comfortable position. Then just be there without moving or doing anything else. However, if the physical discomfort becomes too much, it does no good to suppress it. When that happens, it is better to readjust your body in a comfortable position and then restart the practice session once again. During the practice of looking, certain physical reactions may occur, such as, stabs of pain, drowsiness, dullness of senses, twitches in muscles, and so on. Do not do anything. Do not resist or try to fight them. If the drowsiness overcomes you, let it do so. Just experience the drowsiness. These physical reactions will discharge after some time. If you find yourself getting involved in thoughts or doing something else mentally then simply realize this fact and do nothing else. This will automatically get you back to just being there as an observer. NOTE: To orient yourself to present time you may put some attention on your breathing if necessary. As you recognize and experience the material presented by the mind, new realizations occur. Your ability to experience things improves. As this happens, the mind finds it safe to present more material that you were not aware of before. And so it continues. Try ending each practice session when some persisting reaction has just gone away. Do not end the session while you are in the middle of a reaction. Then that reaction may take longer to go away. This practice of looking is an adventure. You embark on it to become more aware. It helps you discover the causes of conditions and gain control over them. And the results are beyond any expectations. It is true and worked for me just today. I discovered a condition, gained control and became more aware with increased confidence. Thank you for the reminders. That’s wonderful. I am now reviewing KHTK and simplifying its rendition further.